At Quality Refrigeration, we understand how important it is to have your HVACR systems operating efficiently. Ineffective and unmaintained systems can often lead to poor performance, significant down-time, as well as loss of potential revenue. 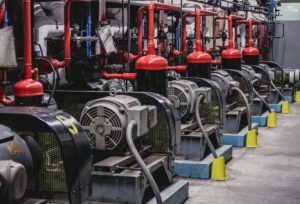 Over the years, we have helped many industrial clients safely install and maintain highly efficient industrial HVACR systems designed to effectively accommodate a full range of requirements. Our fully certified technicians make it a priority to ensure that all systems are not only operating efficiently to get the maximum output, but also perform vital maintenance and routine checks to prevent any issues in the future. We have serviced a diverse range of industrial clients, including oil refineries, industrial bakeries, hospitals, manufacturing facilities, and fish and food processing facilities. A large commercial bakery needed to significantly increase their ice production. After securing the job, Quality Refrigeration suggested adding a 20-ton North Star industrial stainless steel flaked ice machine added to their current equipment. Quality Refrigeration successfully installed the equipment over the course of 2 weeks, and ice production for the bakery is now doubled. A large oil field company required more return on their gas production to support their operations. Quality Refrigeration successfully installed a Century gas chiller condensing unit to replace the company’s smaller unit. With the addition of the new unit, the oil field company was able to increase their gas production, sell more gas back to the gas company, and drastically increase overall revenue. For more information about how we can help your industrial business, contact us today!